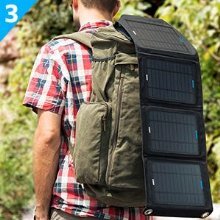 Dual-Port Power: 14 watt monocrystalline solar array provides enough power to charge one device at a time. Compact size (11 × 6.9in / 28 × 17.5cm folded or 34.6 × 11in / 88 × 28cm opened) and well - placed eyeholes allow easy attachment to backpacks while hiking. Tap into the sun’s radiance and power up with freedom. When you’re out enjoying the great outdoors, enjoy yet another perk: free limitless power. Well-placed eyeholes enable easy attachment to your backpack, tent or even trees. 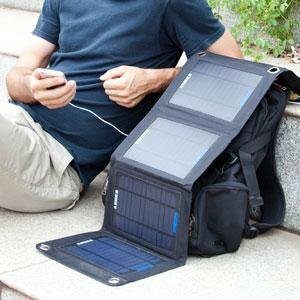 Smaller than a sheet of A4 and weighing under two pounds, the 14W Solar Charger adds minimal bulk to your pack. 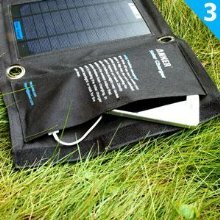 Industry grade PET panels are bound together with heavy-duty polyester canvas, equipping this solar array with ultimate weather-resistant durability. - Minimize exposure to water to protect electrical components. 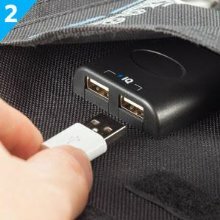 - Use your device’s original cable or a third-party certified one (such as MFI). 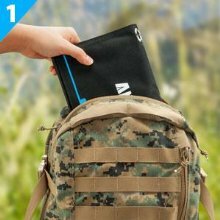 - Compatible with all Apple and Android smartphones, tablets (including the Nexus 7) and other USB-charged devices. The iPod nano, iPod Classic, HP TouchPad, LG G2 and Asus tablets are not supported. Not all charging ports are created equal. Standard ports only charge some devices at full speed and others often really slowly. 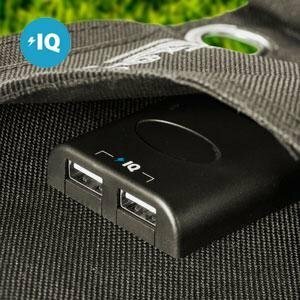 But with PowerIQ technology, each port intelligently identifies your device to deliver its fastest possible charge speed. So you save hours of time. (weather permitting).